The backhand can be a difficult shot when and one you may find yourself constantly trying to improve. Your instinct may be to avoid it as much as possible; to maneuver around to your forehand or to position yourself so that you are more likely to get forehand shots. Unfortunately, your game can only advance so far when you are not able to deliver a strong backhand shot. Also, your opponent will be prepared to exploit such an obvious (and common) weakness. Of course, you will, first, want to take the time to have a solid backhand. Just a dependable stroke that you can count on when the time comes. As you continue to build the skill and your comfort level with the stroke and the sport, you will be able to develop different techniques to make your backhand more than a tool and more of a weapon. Here are five of the most common squash backhand mistakes people make and how to start working to overcome them. It seems simple. You’re playing a game that involves a ball, so of course, you would want to keep your eye on the ball. Most people, however, tend to make this very common mistake. Just as the ball is about to make contact with the strings, they will shift their focus (and with that, body) to where they expect the ball to go. Even the player who tries to only look with their eyes will move their body toward where they are looking. These small movements can impact where your body is and how you finish your shot. Of course, you cannot watch the ball the entire time. Eventually, you need to shift your focus onto where the ball is going. The point, however, is that you watch the ball for as long as possible while you are connecting with the ball. Most importantly, watching it until it hits the strings of your racquet. To work on this skill, practice watching the ball from the moment you are in a position to make your shot all the way through, past when it leaves your racquet. Keep your body still and balanced while you follow the ball with your head and your eyes. While you can feel like you are making good progress with your backhand while breaking your wrist on your swing, you will eventually reach a point where you are not able to advance because you will not have the power and control that comes with having a stable wrist during your backhand motion. 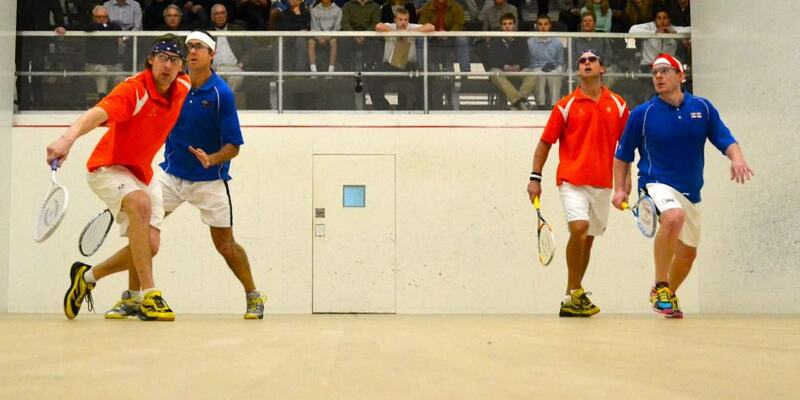 Your wrist is a key component to having a strong backhand in squash. When you break your wrist, you lose control over your racquet and it will wobble. As soon as your racquet begins to wobble, you begin to lose power and control over the ball. By keeping your wrist firm and your racquet head open, you will have more power and it will be easier to control where the ball is going to go. To see the value in this skill put your racquet on the ground. Bounce a ball off of the strings and pay attention to how it bounces, the sound it makes and how high the ball comes off the strings. This is similar to what happens when you break your wrist. Now, put your foot on the racquet and do the same thing. You will notice that the bounce is more controlled and much higher. You will also notice a more distinct “pop” as the ball bounces off the strings. This is what happens when your wrist is firm when you make contact. The ball is under control and you are able to get more power out of the shot. When you want to practice this skill, working on cocking your wrist and keeping it stable throughout the shot. If your wrist is wobbly, you will not have control over where you are going to hit the ball. It can be difficult to realize when this is a problem because, unless you are literally hitting your non-dominant arm while you are swinging, you may not realize it is in the way. The problem, however, is that when your non-dominant arm is in the way of your swing, you are unable to turn your shoulders. When that happens, you lose some of your range of motion and the ability to complete the swing. There are a few ways you can practice this skill when you are trying to improve your backhand. One way is to put your arm behind your back. Of course, this also can cause some limitations for hitting the ball, but the point is for you to begin to learn to keep your arm out of the way while you are working on your backhand. If you have a hard time keeping your arm behind your back, you can hold onto your t-shirt to help you keep it back and out of the way. Part of keeping control over the ball is maintaining your position after you have hit the ball for a moment. Rather than running through your shot, you should try to maintain your position and then take a step back to your recovery position to prepare for your next shot. When you run through, you limit yourself on what shots you can make. Running through limits you to cross-court shots that are more predictable and less effective. While there are circumstances where you need a cross-court shot, you will need to be able to hit straight shots as well. Keep in mind that this is not about follow-through. You should always follow through with your shot completely, but you want to remain stable while you are completing the final components of your shot. You will also find that staying stable for a moment after your shot, it will be easier to keep your eye on the ball as it hits your strings. Once you have it set that you are going to finish your shot before making another move, you will be able to concentrate on all of the aspects of making the shot complete. To practice this, you will want to exaggerate what you are trying to accomplish. When you are actually playing (not practicing) you, of course, will not want to stand for a long period of time. But as you are working on your backhand, concentrate on taking a moment to stop as you are completing your shot. Once you have this down, try to re-channel your energy so that you take a step back after your shot. While you do want to pause for a moment to complete your shot, you do not want to get so occupied with staring at the ball that you are not able to prepare for your next shot. As you complete your backhand, you want to pause while you follow through with the shot before moving backward so you are prepared for the next shot. This does not mean you should take your eye off the ball. It does mean, however, that you should watch the ball while you are moving back into your “ready” position so that you can prepare for your next shot. You do not want to get caught flat-footed when you need to be ready for what is coming your way. 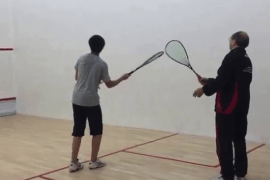 Squash is a fast-paced game and the faster you can get back to recovery or “ready position” the more prepared you will be when the next shot comes. When you are ready to work on this skill, practice moving back to your ready position once you have completed the follow through on your backhand. It can be difficult to watch and process what the ball (and your opponent) is doing while you are moving back, but with continued consistent practice, you will be able to keep yourself from stopping to stare at where you have hit the ball, so you can watch while you move back to your ready position. 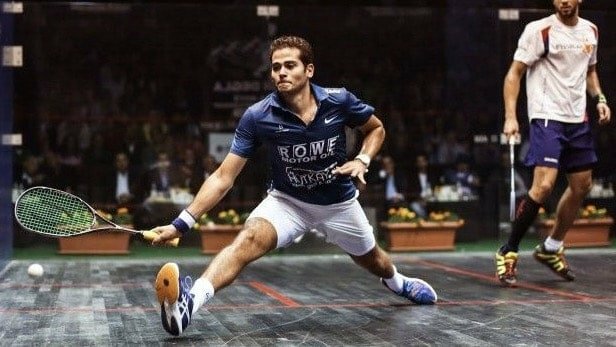 While your backhand may not actually make up 50 percent of the shots you make in squash, it is still a foundational skill that will support your whole game. It is important to take the time to build this skill so that you are able to depend on it when you need it. Even more than that, you will want to be able to develop your backhand so that you are able to use it against your opponent just like you would your forehand. Like any skill, it will take time to build the correct muscle memory as well in your confidence in being able to hit a strong backhand without making some of these common mistakes. As you work on perfecting your backhand, you will have confidence not only in the stroke but in your game as a whole since a strong backhand will help you feel more confident in all the shots that come your way on the squash court.